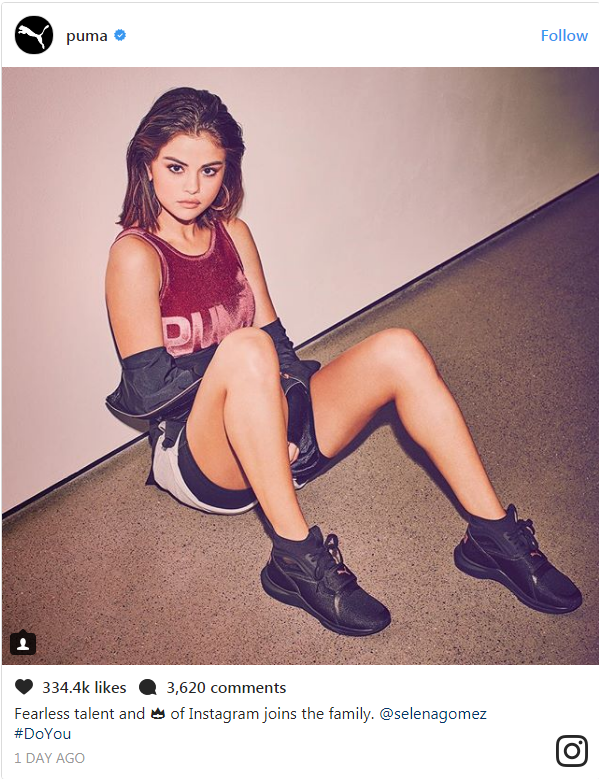 Selena Gomez is teaming up with athletic apparel giant Puma. The 25-year-old singer and actress will serve as the face of the brand and collaborate with the company on a new clothing collection, according to E! News. "Puma has changed the game when it comes to the mashup of athletic wear and fashion," Gomez said in a news release. "It's amazing to see this influence on style and culture and I'm excited to be a part of it." "I'm hoping that we can create something special together," she added. "We already have some really cool projects in the works." Gomez and Puma also announced the news Monday on Instagram. 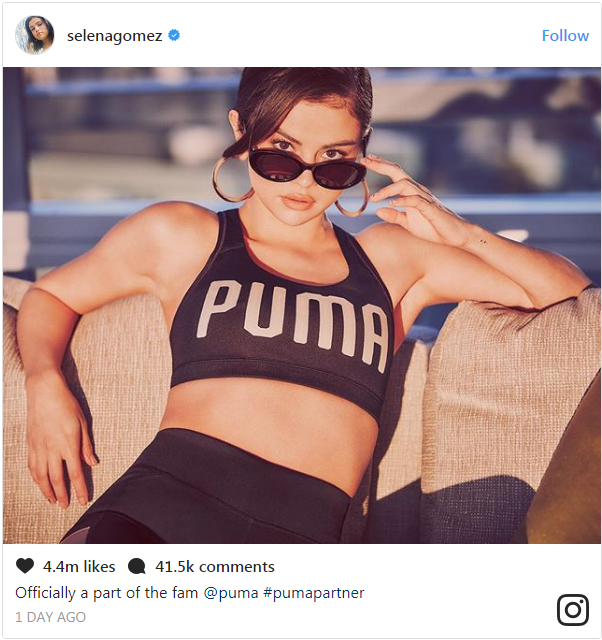 The singer posted a photo of herself in a sports bra and sunglasses, while Puma shared a picture of Gomez in a velour top and shorts. "Officially a part of the fam @puma #pumapartner," Gomez wrote. "Fearless talent and [queen] of Instagram joins the family. @selenagomez #DoYou," Puma added. Gomez said in an interview with Vogue that she was drawn to the ease and variety of Puma's clothes. She said her boyfriend, singer The Weeknd, is also a fan of the brand. "That's what's really cool about what Puma's been doing lately. It's all these pieces that you know are going to look good together, so it's just kind of throwing this on, throwing that on," the singer said. "I mean, at this point, my boyfriend and I share closets, and [we're] just kind of throwing different ideas around," she added. "Sometimes I'll throw on his Puma stuff and just go out with my shoes. I'll just wear that as a little cute date-night dress or something to the movies. You want to feel confident in it."